Comet Tico is a unique Luma found in Super Mario Galaxy. Its appearance is that of a purple Hungry Luma and Lumalee that holds up two sticks with stars on the ends in each hand, similar to a Hungry Luma's sticks, which have color-changing Star Bits on the ends. It is located just outside the Terrace on the Comet Observatory, and appears only after Mario has collected a total of thirteen Power Stars, which causes various types of Prankster Comets to begin appearing. When Mario talks to Comet Tico, it will give Mario two options to choose from: "Tell Me More!" or "Move It!". If the player chooses the "Tell Me More!" option, Comet Tico will give Mario information about the different types of Prankster Comets, which mainly entails the various effects that each type of Prankster Comet has on a galaxy's normal operation. Originally, Comet Tico will only give Mario information about Speedy Comets, Daredevil Comets, Cosmic Comets, and Fast Foe Comets, but once Mario has defeated Bowser at the center of the universe, Comet Tico will also tell Mario about the fifth type of comet, the Purple Comet. Asking Comet Tico for information about the Prankster Comets does not require the player to relinquish any Star Bits. The player should choose the "Move It!" option when they want the current position of the Prankster Comets orbiting a particular galaxy or galaxies to be moved. 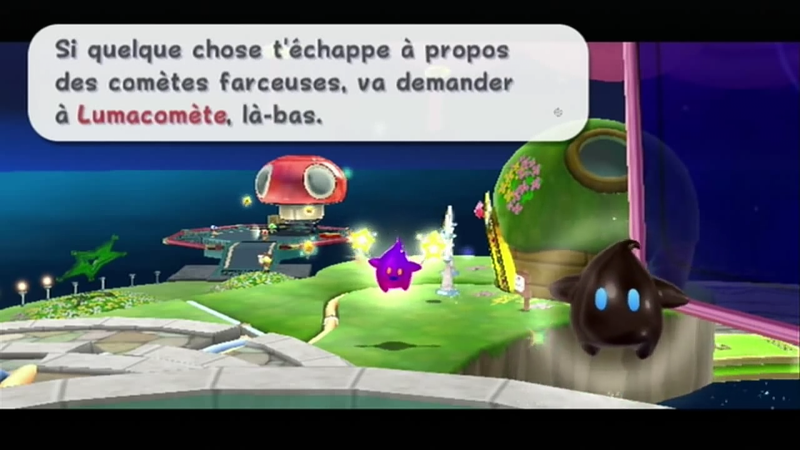 Each time the player asks Comet Tico to shuffle around the positions of the Prankster Comets, Mario must pay it 20 Star Bits, after which it will flash white like a transforming Hungry Luma. A second later, the map of the Comet Observatory will be displayed, indicating the new positions of the Prankster Comets. If Mario has only completed a few Prankster Comet missions when he asks Comet Tico to move the comets, it will usually move different Prankster Comets to new galaxies and take away the existing Prankster Comets from the old galaxies. When Mario has completed many of the Prankster Comet missions, Comet Tico will occasionally do away with all of the existing Prankster Comets, leaving none available. When Mario uses this same option a second time, or completes a mission in any various galaxy, the Prankster Comets will all return to their previous positions. Kometto Chiko Comet Luma; officially written as "Comet Tico"
↑ Dialogue by Polari: "Si quelque chose t'échappe à propos des comètes farceuses, va demander à Lumacomète, là-bas" can be translated as "If there is something you don't get about Prankster Comets, go ask Lumacomète, there." This page was last edited on April 24, 2019, at 13:14.